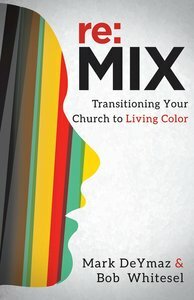 re:MIX: Transitioning Your Church to Living Color is a practical guide for pastors, denominational leaders, and lay leaders who are seeking to transition their monoethnic congregations into healthy multiethnic churches of Christ-centered faith. The book is theologically sound, cross-culturally relevant, and based on field research. It provides transferrable lessons and practices that are applicable in a variety of local church and denominational contexts. Authors Mark DeYmaz and Bob Whitesel demonstrate that such transitions are not just timely or optional. Indeed, these biblically grounded transitions are necessary for churches pursuing growth and health in an increasingly diverse society. By becoming a church of living color, existing or declining churches present a more credible witness of God's love for all people and can achieve renewed significance and sustainability. "Wow! This is the practical tool for the church that I have been waiting for. Pentecost didn't occur until the diversity of 'every nation under heaven' was present. This book will become recommended reading for all of my seminary students." Bob Whitesel is professor of Christian ministry and missional leadership at Wesley Seminary at Indiana Wesleyan University in Marion, Indiana, and president of C3 International (Creative Church Consulting). He is also the author of several books including Spiritual Waypoints, Waypoint, and Preparing for Change Reaction.